Pools, spas and water features are a very popular aspect of the outdoor landscape in many Southern California homes. I don’t have the statistics, but between fountains, spas, hot tubs, koi ponds, and pools it seems a huge percentage of San Diego homes are equipped with at least one of these features, and some pretty elaborate ones, too. I have had personal experience with Hallmark Pools and Spas and recommend them highly. 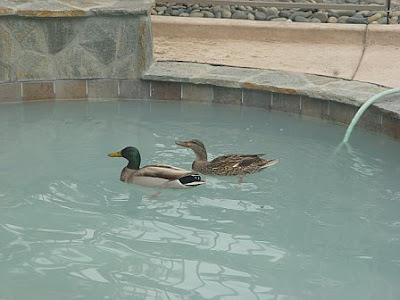 We hired them to design and build our in-ground spa (see photo - BTW the ducks did not come with the spa, they just showed up the day we filled it) here in Carlsbad, complete with a water feature, 8 jets at varying heights, and approximately 10 X 14 feet in size. They did a great job with the design and execution and we have recommended them a number of times. Contact Ron Dedrick through the main office at (858) 391-3434 if you are interested in getting an estimate and discussing design options. There are a number of other companies around that provide a range of design and building services for spas, pools and more. I can’t comment on these since I have no experience, but thought the list of a few other vendors may be useful. A Google search will yield even more. I recommend getting a recommendation from someone who has used the vendor. You should also check references. And checking them out with the Better Business Bureau doesn't hurt either. One of the things that was very noticeable to me when I first moved out here was the amount of surfing -sure, there is surfing back in Boston, especially on Cape Cod (even a few diehards in the dead of winter), but nothing as pervasive as you find here. It seems to be the most popular pastime. I imagine those who have lived here for years, or who grew up here, don't really notice it all that much, or think much about it. Anyhow, since I have paid more attention to the surfing culture and the influence it has had on various communities, I wrote an article about it the other day on my ActiveRain blog. I'd be curious to hear from surfers out there. Getting around in North County continues to be a challenge. Traffic is the issue, of course, and now that summer is here it has gotten worse. The freeway tends to be more of a parking lot since we had the San Diego County Fair a few weeks ago, the racing season at Del Mar is currently in full swing, and there are more tourists (and local residents whose kids are not in school) out enjoying the terrific weather and all the things to do. 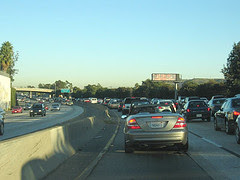 I avoid the freeway at all costs, especially at rush hour (which seems to be rush hours...about 6 of them or more a day) unless I feel like sitting in traffic (link is to traffic report). There are a good number of people who rely on public transportation - some to avoid traffic and parking issues, and others because they don't have cars (hard to imagine in this state where the auto reigns supreme). Options for transportation here in North County are fairly good, actually. There is the Coaster (the train that runs between Oceanside and San Diego) and Amtrak (not really a commuter train but if you need to get up to LA and some other coastal towns this is the way to go). There is also the Breeze (the buses) although because it supposedly is so simple to get around (it's a breeze) they don't refer to them as buses but just by the name. The NEW ADDITION to the transportation system that will help locals and visitors, especially those going east and west (yep, those roads, like 78, get real ugly too), is the new light rail line running from Escondido to Oceanside - the SPRINTER. The lines are already under construction and expected to be completed in December 2007. And of course you can always travel by bike, skate board, roller blades, on foot, or motorcycle. And downtown San Diego offers other options, like those bicycle taxi things in the gas lamp district. But I shouldn't complain - there are other cities in the world with far worse traffic than us - like Mexico City, Sao Paulo, Bangkok, Tokyo and more. Have you been to Atlanta or Washington, DC lately? 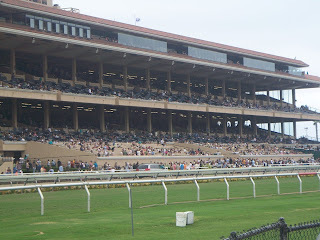 I attended my first races at the Del Mar Race Track yesterday. I haven't been to the races for many years, and never to the Del Mar track, so it was great fun to see this landmark, also the site of the San Diego County Fair and many other expositions. We got to enjoy the Stretch Run/Infield area, as I was there for a real estate networking event with ActiveRain folks and the Sellsius Blog Tour USA. There are a number of choices of where to sit, depending on whether you want a seat or not, would like to dine, and where. Admission ranges from $5 to $25 - you can buy tickets at the track or on-line. Parking seemed pretty adequate (although I understand that Opening Day on the 18th was mobbed). Parking is $8 but you can also Valet Park for $20. Racing season this year (with the new PolyTrack to provide increased safety for the horses and riders) runs from July 18 through September 5. It's worth the trip if you have not been before. Where I live in North County San Diego there are 2 major roads heading north and south. The 5 is the freeway (I still sometimes call it the highway - a throwback to my many years back East where that is what the big roads are called), of course, which I travel occasionally into the city and when driving to Los Angeles (I generally end up taking it to the 405 up in Orange County). The other is Route 101, called the Coast or Coastal Highway, that is a more local road along the ocean, running from Oceanside to Torrey Pines (I suppose technically it keep going but has other names). The road actually runs most of the west coast and up in Los Angeles is more of a freeway itself - it's known by a variety of names depending on where you are. 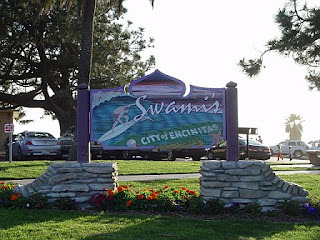 In any case, I have driven the entire length of the road here and, like Route 1, it has an amazing array of things to do along it, in addition to some terrific ocean views (especially near Carlsbad Village, south Encinitas, Cardiff, briefly in north Del Mar and in south Del Mar as you approach Torrey Pines). I find it a better local road to travel if I don't need to go far, and when traffic on the 5 is really ugly it is much faster, despite the lights. And sometimes commuting as a slower pace (unlike 80 mph on the 5) is a good deal. Plus it is another one of the interesting things to do in San Diego. What do you think about this road? I apologize for not including more posts in the last week or so. Seems like my busy life has gotten busier, and I have been traveling, too. But that is not a good excuse. Being without Internet access for days at a time, however, really puts a crimp in my writing - and blogging from my Blackberry is just not doable. 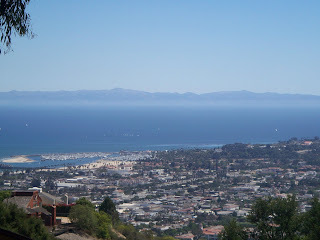 Anyhow...I spent some time in Santa Barbara for a business meeting last Thursday. So for those of you who have not visited, I highly recommend it. I wrote a post about my visit and included some photos, and it's only a 3.5 hour drive (without traffic). Absolutely worth a visit. I also spent the weekend in Los Angeles, just 2 hours north of us. Such a change from San Diego, and so much to do there as well. I spent a good part of a day at the Getty Museum, which I highly recommend. I also visited the Santa Monica pier, Bergamot Center where all the art galleries are, and the 3rd Street Promenade in Santa Monica (more on all that later). Yep, the traffic is worse now that summer is here and the tourists are around, but if you plan your time it's not bad. I love all there is to do here, but having the option to visit another great city is wonderful. I wanted to share some information about a personal chef service in the San Diego and North County coastal area for those of you with busy lives (who isn't?) and who might be interested in an alternative to buying fast food or always going out to eat because you don't have time, or energy, to fix shop for and prepare regular meals at home. Pamela Croft is a delight. I have gotten to know her through my wife and their membership in the Rancho Santa Fe Business Professional Women's Organization. In fact we were just at a terrific picnic hosted by Pam yesterday in Del Mar in honor of 7/7/07. Pam's company, Dinner at Home, provides in-home food services in the form of meals cooked at your home, using the finest and freshest ingredients, and a menu she designs with your requirements in mind, for couples, singles or families. The meals are prepared for storage in your refrigerator or freezer (conveniently labeled and with heating instructions) , and plans may be selected for weekly, bi-weekly or monthly cooking dates. She will also include side dishes and make suggestions for accompaniments; the standard service is for 5 meals with up to 4 servings. As a Culinary Business Academy-trained chef, she can meet any of your culinary needs. Even better, her business partner and Sommelier, Jay Wexler, can provide recommendations for wine pairings to further enhance your in-home dining, based on your personal preferences and needs, and assist you in learning more about wines in general. 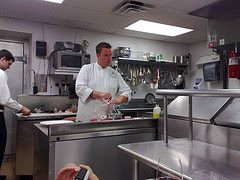 Dinner at Home with a personal chef is a terrific solution for busy singles, couples and families who enjoy fine dining, but don't want to spend lots of money going out to restaurants or don't have time for shopping and food preparation. You can also use Pam and Jay's services for that special dinner party or intimate gathering in your home as opposed to hiring a large catering service. Or how about giving the gift of personal chef in-home services for that special someone or a special occasion? Gift certificates are available. 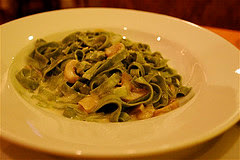 Why not try Dinner at Home? Give them a call to learn more. As part of my exploration of things to do in San Diego (and in this case, because I live here and love things to do in Carlsbad) I wanted to share some information about the 2007 ArtSplash, a very popular event in North County. Folks come down from Orange County as well to attend this event. 2007 ArtSplash will be held for 2 days on September 22 and 23 on Armada Drive just behind the Flower Fields off Palomar Airport Road (and east of the freeway). 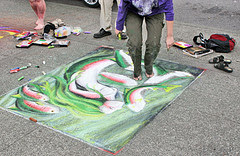 A major focus of this event is the age-old European tradition of chalk art street painting - I have not been before but I understand it is QUITE impressive. Other activities include fine art displays and demonstrations, hands-on art activities for all, stage and street entertainment (the Fern Street Circus will perform on Sunday) and terrific food (the Taste of Carlsbad will occur on Saturday from 2 - 5 PM). This event benefits the arts programs in the Carlsbad Schools. Don't miss this great round of activities, food and fun. This Saturday is a lucky day, or at least is believed to be, as it is the Seventh Month and the Seventh Day in 2007 - 7/7/07. But Saturday is also a monumental day for the environment and people worldwide...perhaps 2 billion of them. 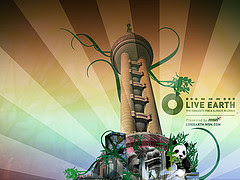 Read more about this huge event on my ActiveRain blog, and learn how you can be involved in worldwide efforts to combat our climate crisis, and listen in on the Live Earth concerts if you can't attend one of the 8 around the world. The longer I live here the more I find to do in and around San Diego. The fabulous weather, of course, leads one to explore mostly outdoor activities, whether it be the beaches, the Del Mar Race Track (currently the County Fair is in full swing but ending soon on July 4), or other major tourist attractions. But there is lots of other stuff to do as well. And with summer here, there is an even larger list of things to do in San Diego. Here's a partial list of my favorites. Art, Wine and Jazz Festival July 7- local artists demonstrating on canvas, palette and sound, at the Bernardo Winery. Horse Racing - starts July 18 and runs through September 5 at the Del Mar Race Track. Tennis - The Acura Tennis Classic at La Costa Spa and Resort. The resort also hosts its Spa Under the Stars events on Thursdays with wine, appetizers and reduced-cost spa treatments in their courtyard. Music - TGIF Jazz in the Park every Friday from 6 - 8 PM in one of Carlsbad's parks (FREE); Jazz on the Green concerts on Fridays in July at the Four Seasons in Carlsbad. Baseball - the Padres continue their play all summer. Why not attend when a "favorite" opposing team is playing?